Over the years, Amy Gallatin has visited Profiles in Folk several times for solo appearances and with Stillwaters, her bluegrass group. She returned this night with her new group, The Hot Flashes, and what an evening of music it was everything from Johnny Mercer to David Mallett to Tim O’Brien and a lot more sandwiched in between. His was one of those shows where we went in with the hope of doing 60 minutes live and came out with the entire show live. Our thanks once again to WSHU Chief Engineer Paul Litwinowich who handled the sound. Hot Flashes is an energetic and invigorating trio of female vocalists. 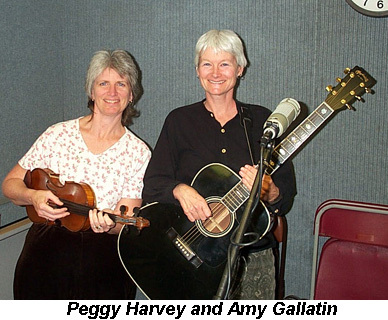 There’s Amy, Peggy Harvey, one of the founding members of Traver Hollow who brought a truckload of instruments, and blues stylist and songwriter Gayle Wade. Rounding out the group is mandolin player extraordinaire Kevin Lynch and smooth upright bassist John Urbanik, both of Stillwaters. The group’s music draws from bluegrass, folk, swing, jazz and blues, a bit of country and some original compositions. This summer the group will be appearing, among other shows, at the Strawberry Park Bluegrass Festival (May 29-31), the Foot Stompin’ Festival in Stafford Springs (July 4-5) and the Podunk Bluegrass Festival (Aug. 1-3). They will be touring Europe in June.